Color hue, the essential quality which differentiates colors. Luminance; allows classification in relation with an achromatic (grey) scale – we say that the color is light or dark. When mixing two colors, the resulting color is placed on the imaginary line between the two original ones. Its placement on this line is in accordance with the ratio of the two original colors. The CIE-XYZ contains an infinite number of colors and those that are very close to each other in the diagram are highly alike. The ‘distance' between two colors represents the similarity between them. The closer they are, the more they look the same. But the human visual system can only distinguish two colors as being different if they are slightly apart. The minimum distance between two colors for which the ‘average human observer' can still tell them apart is called the MacAdam distance. For any given color in the CIE-XYZ space, there is an area (MacAdam ellipse) surrounding that particular color containing colors that are perceived as being the same as the original color. Since the human visual system is sensitive in different degrees to red, green and blue, the MacAdam ellipses vary in shape and area depending on the location in the color space. A rough representation of the MacAdam ellipses for several colors in the CIE-XYZ color space is shown below. The area of the ellipses is highly exaggerated in order to illustrate the concept. A more ‘perceptual' representation of the CIE-XYZ color space can be obtained by reshaping it so that the MacAdam ellipses are in fact circles that all have the same area. This was attempted with more contemporary CIE diagrams, but the XYZ remains the standard. Having defined the CIE-XYZ colorimetric system, we can discuss color spaces. A color space is the sum of all the colors that can be represented starting from a set of primaries and a blending (color mixing) rule. Moreover, it is a mathematical description of how colors can be uniquely identified by a suite of values called color components. Forcing the definition, the CIE-XYZ colorimetric system is in itself a color space (the color space of human color vision). 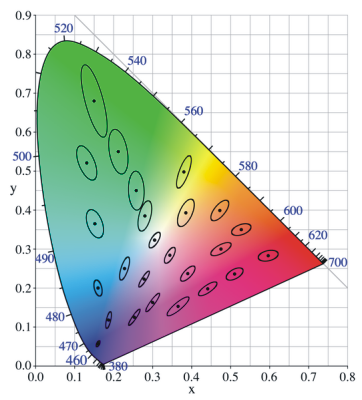 All color spaces within the CIE-XYZ are three dimensional spaces and the horseshoe diagram is a slice in the CIE-XYZ color space for maximum z (maximum brightness). In the CIE-XYZ-derived color spaces, the rule is additive mixing. To create a color space (a subspace) in the CIE-XYZ, any number of primaries can be used. Within the chromaticity (horseshoe) diagram, a color space would look like a polygon with the primaries as its tips. The area of the polygon for a particular color space is called the gamut of that space. The bigger the gamut, the larger the number of colors contained. Any useful color space would include the white point, and the simplest ones to describe only use three primaries. Since you can only obtain a triangular area using three primaries and the horseshoe is far from being triangular, many colors will be inevitably left out of any three-primary color space. For an analogy with the human visual system the primaries can be red, green and blue. The chromaticity diagram contains many reds, greens and blues, so different color spaces can be created. The primaries can be chosen from all the colors, but by choosing very saturated primaries (i.e. peripheral colors), the resulting color space will obviously include more saturated colors. All the RGB spaces have in common the three parameters used for describing a color, namely the amounts of primary red, green and blue (color coordinates). For any particular color, if the primaries (i.e. the color space) are changed, the color coordinates of the color will be different; the color stays the same, the reference system changes. Hence, the need of proper techniques for changing color spaces. The default color space is sRGB. It is the standard for web browsers and virtually all consumer cameras and has a gamut covering roughly one third of the visible colors, and lacking particularly in the ability to represent very saturated cyan, green and to some extent, yellow. AdobeRGB (1998) is an extension of the sRGB color space. The red and blue primaries are kept from sRGB but the green primary is shifted to a more saturated color, resulting in the capacity to represent more (and in particular more saturated) shades of green and cyan. 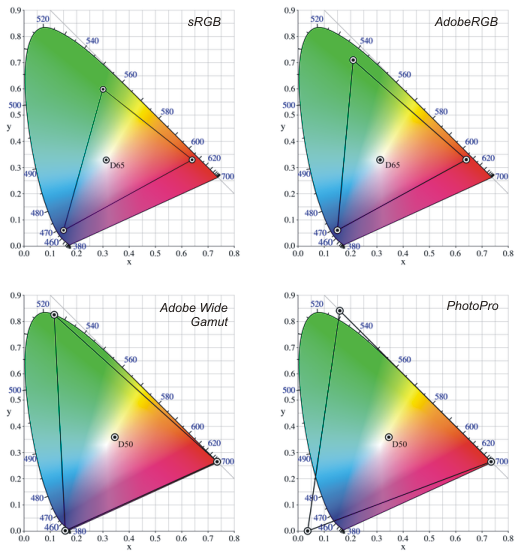 AdobeRGB has a wider gamut than sRGB and it contains around 50% of the colors in the chromaticity diagram. Although sRGB is included in AdobeRGB, converting between the two spaces may raise some problems if not done properly; more on that in the last part of this article. Still wider is the Adobe Wide Gamut color space. All three primaries are fully saturated and the gamut is almost 80% of the visible colors. This color space is not widely used and, because of the very wide gamut, justifies using a 16bit color depth per channel. Bit depth will also be discussed further. An even wider color space is called PhotoPro which uses a spectral red but imaginary (not present in the chromaticity diagram) blue and green primaries. It can represent just over 90% of the real colors but it contains around 13% virtual colors that cannot be represented on any medium (wasted bits). The figure below exemplifies how the proportions of red, green and blue affect the look of a color. A reference color (‘perforated' patch) was selected, its R, G and B proportions being unequal (otherwise it would have been grey). The RGB color spaces described above additively mix the primaries to obtain the desired color. Subtractive mixing uses mainly cyan, magenta and yellow as primaries and is generally used for white media (i.e. printing). It is interesting to observe that taking any RGB color space (triangle in the chromaticity diagram), the cyan, magenta, and yellow colors are situated (roughly) halfway between two RGB primaries on the sides of the triangle. CMY color spaces generally have a smaller gamut than the sRGB color space, particularly because that they do not contain very dark saturated colors. Subtracting fully saturated C, M and Y from white at the same time does not create black. This is the reason black is usually added as a primary. It is abbreviated K from ‘key'. A serious problem arising when converting from RGB to CMYK (which happens whenever you print something digital) is represented by the fact that, generally speaking, there are colors in RGB that are not present in CMYK and vice versa. Just as with the RGB example, the figure below demonstrates the effect of altering the amount of one color component while keeping the other three unchanged. On each line the colors are about 12.5% apart in terms of the proportion of C, M, Y and K respectively. The ‘reference' color (again the perforated patch) occupies a different position on each row because of the different proportions of C, M, Y and K present within it (it has less cyan than it has magenta etc).